Front Row (Left to Right) Royden Watkins, Arturo Pineda, Keyson Whiteside, Jamarr McCain, Michael Stradley. Back Row (Left to Right) John Gillespie (Coach), Jordan Brown (Coach), Steven McKinney (Coach), Delshawn Anderson, Denise Jackson (Coach), Antonia Adams, Maegan Carter, Grace Russ, Kristal Herrin, Blair Massey (Attorney Coach), Erin Sweeney (Coach), Presiding Judge John Rucker, Kaitlyn Pugh (Coach). Not pictured, Sen. Shane Massey Coach). March 16, 2015 – Last Year Strom Thurmond High’s Mock Trial Team was named first runner-up. This year they brought home the state title and brought home the gavel. Twelve schools competed March 13-14 at the Matthew J. Perry, Jr. Federal Courthouse in Columbia. At the state competition students presented the prosecution and defense sides of a fictitious criminal case before a panel of volunteer lawyers and judges. This year’s case focused on a university student’s role in the research of security threats and ultimate hacking of a retailer’s website. As a part of the case, students discussed financial transaction card fraud, financial transaction card or number theft and computer crime. Students filled the roles of attorneys, witnesses, bailiffs and timekeepers, and each team was judged on its presentation skills, rather than the legal merits of the case. The students presented the same case at the qualifying regional competition. Individual winners for best attorney were Jamarr McCain(3) and Arturo Pineda(1) and for best witness were Keyson Whiteside and Royden Watkins. Ms. Jackson also said special recognition should go to Attorney Blair Massey, wife of Senator Shane Massey, without whose legal tenacity the team could not have won. 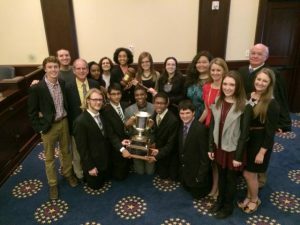 The 2015 State High School Mock Trial champion will advance to the National High School Mock Trial Championship competition held in Raleigh, N.C. May 14-16. Any donations to finance this trip would be appreciated and can be sent to Strom Thurmond High School and put Mock Trial in the memo line.